Hello and welcome to the MFT and Misti collaboration. 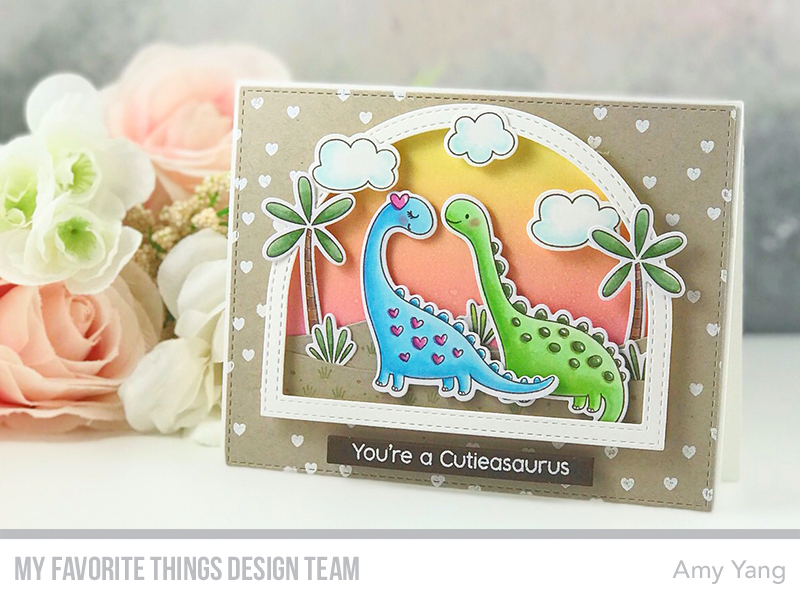 I have a fun project to share with you featuring the adorable Cutieasaurus set. 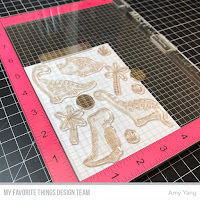 I always start my projects off by stamping the images using the Misti Stamping Tool. I love how it gives me consistent stamping. 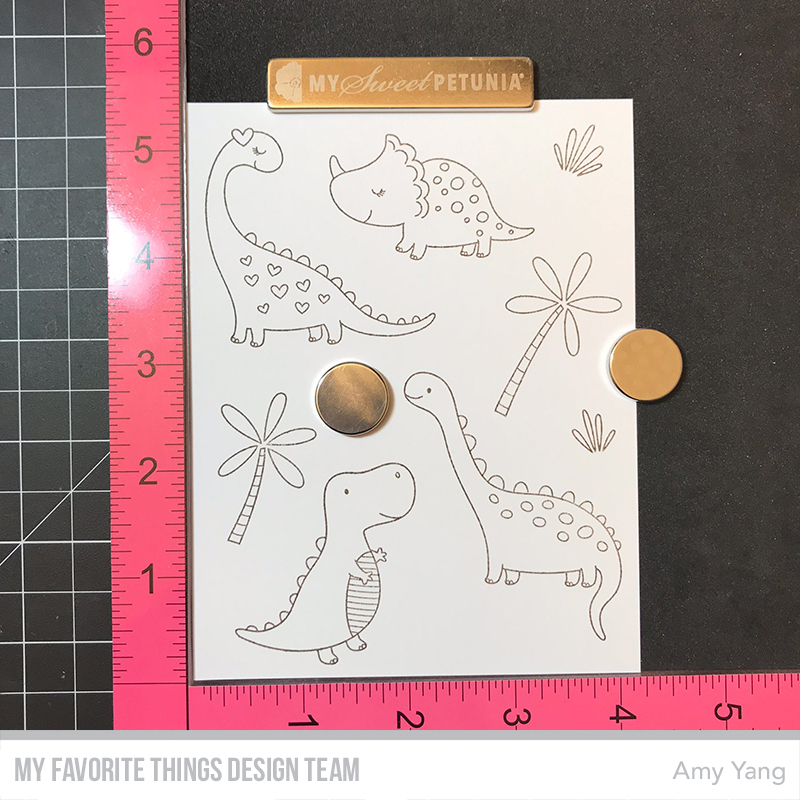 After I stamped the images from the Cutieasaurus stamp set, I colored the images with Copic markers and cut them out with the coordinating dies. I created the white embossed heart background by using the BG Scattered Hearts Background on Neenah Desert Storm paper and die-cut it with a die from the A2 Stitched Rectangle STAX Set 1. The front panel inside the dome frame was ink blended with Distress Oxides. The hill panels made with Neenah Desert Store paper and were die-cut using the Snow Drift Die-namics. On the panels, I stamped the grass from the Cutieasaurus with Gumdrop Green Hybrid Ink and added little rock dots with Copic marker. The dome frame was die-cut using the Stitched Dome Frames Die-namics. To finish, I adhered the panels, the dome frame and the images as shown using doubled sided tape or foam tape. The sentiment was white heat embossed on Hot Fudge Prestige Card Stock and cut out with a die from Hearts in a Row - Verticle. Thank you for visiting me today. I hope you enjoyed my project. 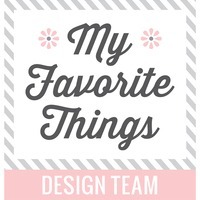 Make sure to visit the MFT Blog for a chance to win awesome giveaways and view the participating design team projects. Hi Amy. 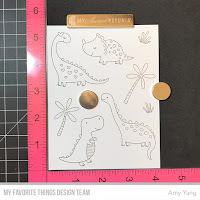 Your little dinosaur card is gorgeous - love all the elements used and the result is fabulous. Beautiful work, so thanks so much for sharing with us. The Misti is a fantastic tool - whoever invented it deserves a medal. Hi Amy, your cards are super sweet. I love the flying elephant. I love my 4 Misti 's. I use then every day and I love MFT stamps. 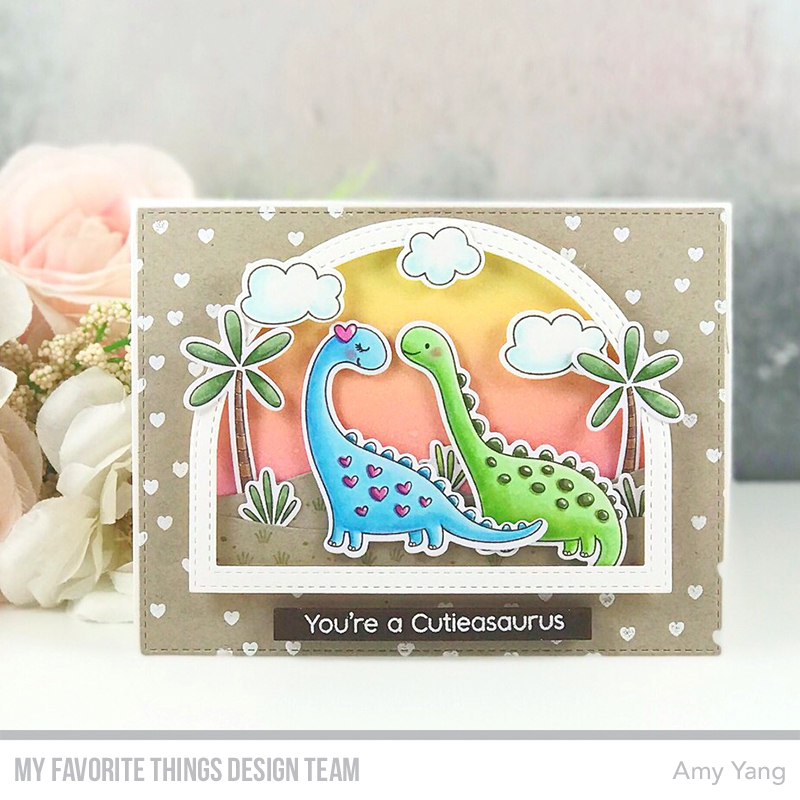 Oh Amy, this set was aptly named....Cutieasaurus it IS! These little guys can't get any CUTER! 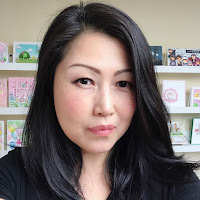 Your card is beautifully done and the colour choices you used are amazing. Very well done! Just darling! This set is so sweet and the card is wonderful! I so need a Misti! Adorable card, the dinosaurs are so cute. Thanks for sharing. so fun, love your sweet card. The scene you created is perfect. Who wouldn't feel extra special receiving this card?? So cute! Great card! I love all the little details you added!!! This set is so adorable! I love your colouring - just beautiful! This dino couple is SOOO CUTE! I love how you colored them! Your tiny dinosaur card is really cute! I love the gorgeous blend of color in the background - so flawless! Fun design too! Oh, what a beautiful and adorable card! Such fantastic blending and coloring. Love the sweet scene and layers. 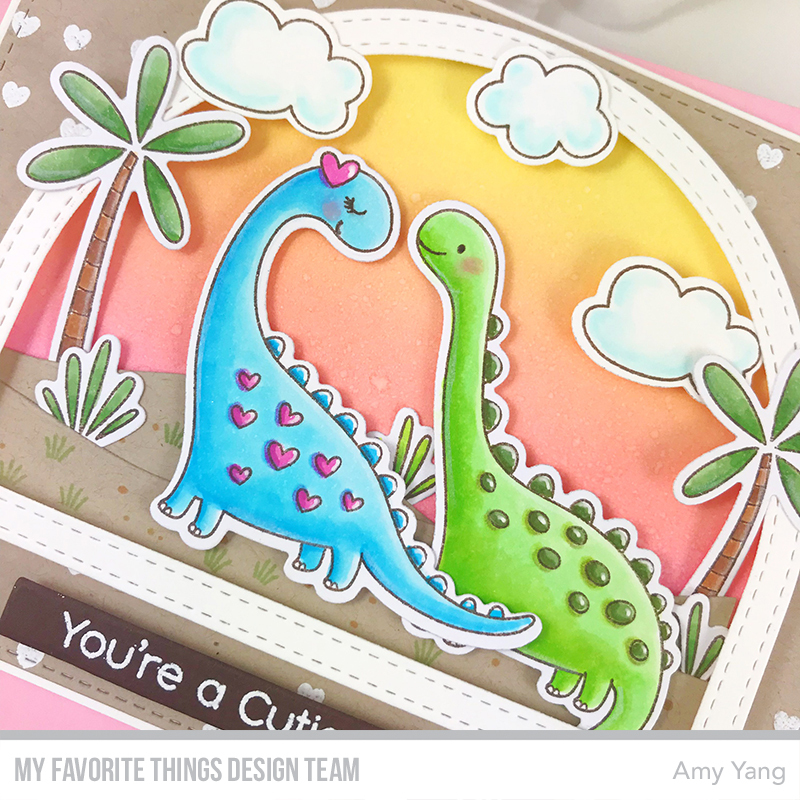 Adorable dinosaur card. I love the little scene you created. Cute scene, great 3-d dimension. Multiple stamping at once! Why don't I ever think to do that? Such a time saver. Your card is beautiful!! I love the gorgeous coloring and your design! LOVE! Such a CUTE card. Love all the colors and design, awesome! So cute, lovely colours. 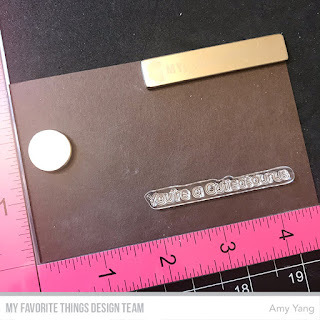 The Misti makes stamping so much fun. Amazing dimension in this cute card- love the stamp set too! So cute!! Dinosaurs in love!! I love your coloring!! Beautiful!! Thank you for the step by step. Card is so darling! ADORABLE!!!!! I love the sky--so pretty, the dinosaurs in love, so cute, just everything. I would like to make a card for my dinosaur loving 4 year old grandson. Nice! 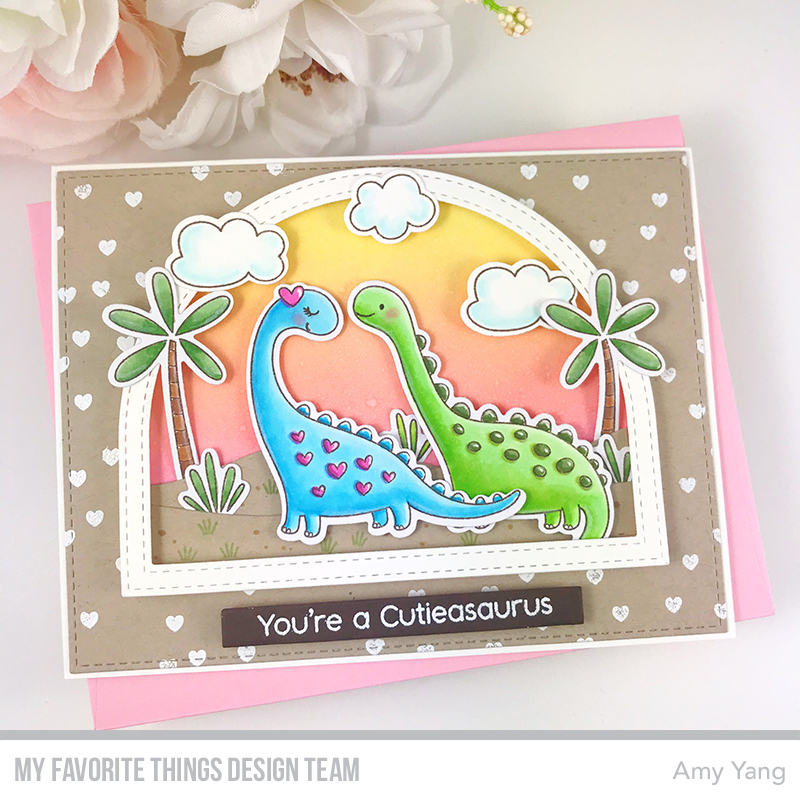 I love everything about this card - the layout, coloration and the images! It's winner! Cute dome scene. I like the colors. Absolutely adore your cute card! Love the colors and the design!